If you are an adventure lover and seeking profound contact with nature, then, trekking is an ideal activity for you! From one end of Greece to the other, idyllic paths crossing mountains, lush gorges, streams and enchanting canyons unfold! So, if you are looking for a way to combine entertainment and virgin sites exploration, with training and fitness improvement, then, you have to give it a try. Hiking is an activity not only held all year round, but also adapted to your needs. Depending on your schedule, stamina and mood, you can choose between intra-day, one-day or multi-day hike. Before getting started, you should bring all the necessary equipment, as this activity has some peculiarities; light and flexible boots, comfortable clothing (adapted to the season), sunglasses, sunscreen, outdoor head torch and individual pharmacy. If you choose to go on a multi-day hike, do not forget your sleeping bag and tent. Based on the degree of difficulty, hiking is divided into three categories: simple hiking, trekking and mountaineering. In simple hiking trails followed are with very little slope, and of a distance of at least five kilometers, covered in a period ranging from one to two hours. For beginners, this kind of hiking is ideal, as the routes are on level ground and there are no great differences in altitude. Simply hiking can be organized in a forest area, in the mountains or by the sea. Mountain hiking or trekking is more demanding, as the distance covered can reach up to 20 km, and there is a significant difference in altitudes. Usually, the trip lasts between 5 to 8 hours. This type of hiking is suggested to those who already have some experience in simple hiking and also have a good physical condition. If you are an adrenaline lover and want to enhance the degree of difficulty of your excursion, then, you can try mountaineering, which is rightly called the most difficult kind of hiking. Usually, the goal of a mountain excursion is the conquest of the mountaintop. Key to successful climbing is the right equipment, especially during winter season; crampons (a traction device attached to footwear to improve stable walking on snow or ice) and piolets (two-headed special ice ax to enhance balance and safe driving on snowy ground) are must-haves. Prerequisite for this activity is not only excellent physical condition, but also long preoccupation with this sport. For your first steps as climbers, you may want to consult a qualified mountaineering club. Indicatively, the ideal destination for mountaineering is Olympus, which has excellent trails, with most popular the ones defined by the E4 European Path and O2 National Trail. In every corner of Greece, you will find trails which cross idyllic locations, offering at the same time spectacular views. Santorini is rightly called a hikers’ paradise, as the volcanic character and the eerie beauty of the island convert hiking into a lifetime experience! 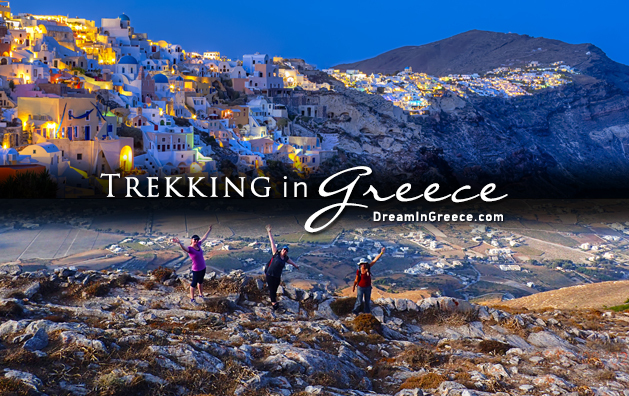 Perfect to introduce you to the magical world of trekking is Trekking Hellas Cyclades. Hike along the famous trail which unwinds from Firà to Oia, admire the breathtaking views of the deep blue sea and relax by having a picnic and enjoying delicious Santorinian delicacies. So, if the idea to explore pristine areas, discover forgotten villages, cross spectacular gorges, visit gurgling rivers, admire landscapes of incomparable natural beauty, and get to know rare flora and fauna species, seems tempting, then, you only have to try trekking around Greece!